The grasslands of Saskatchewan lie at the northern end of the prairies and great plains of North America. The grasslands of Saskatchewan lie at the northern end of the prairies and great plains of North America. Since the late nineteenth century central and southern Saskatchewan has been resettled by migrants from other parts of Canada and Europe. The colonization, displacement, and marginalization of the Cree, Assiniboine, Saulteaux, Dene, Dakota, and Métis peoples was part of a wider process across the North American grasslands. The agricultural settlement by outsiders of the prairies and plains repeated a similar process in another temperate grassland, the steppes of Eurasia, that began in the eighteenth century. The steppes extend across today’s Moldova, Ukraine, the Russian Federation, and Kazakhstan (all formerly parts of the Russian Empire and the Soviet Union), and into Mongolia and northern China. There are striking parallels between the environments of the North American and Eurasian grasslands. The banner image is the Saryarka Steppe of northern Kazakhstan, yet could be mistaken for Saskatchewan. Both are grasslands (large parts of which have been ploughed up) with few trees, continental climates, periodic droughts and high winds, but very fertile soils attractive to farmers. The parallels between the climates of Saskatoon and Astana, in northern Kazakhstan, are particularly striking. The climates of the North American and Eurasian grasslands are both given the same classification (Dfb) in the Köppen-Geiger system. The grasslands south of Saskatchewan and west of Astana, however, have less extreme temperatures and more precipitation, making them more favourable for agriculture. There are also connections between the North American and Eurasian grasslands. We explored some of then during the CHESS field trip on May 31-June 1, 2018. The migrants who moved to Saskatchewan included people from the Eurasian steppes. Thanks to one of the organisers of CHESS 2018, Ashleigh Androsoff, we visited the Doukhobor Community at Blaine Lake, where we were met with great hospitality, entertained with their beautiful singing, and had keynote lectures by Geoff Cunfer and myself. In 1899 6,000 Doukhobors arrived in the Canadian prairies from the Russian Empire. They were a pacifist Christian sect that rejected the authority of the Russian Orthodox Church and refused to serve in the Russian army. The tsarist authorities banished them to the steppes of today’s southern Ukraine and later to the South Caucasus. At the end of the nineteenth century they were allowed to leave and made their way to Canada. Members of another pacifist religious sect moved from the steppes to the grasslands of North America, including Saskatchewan, from the 1870s. Mennonites are ethnically Germanic and their religious beliefs can be traced back to the Anabaptists of the Reformation. Enterprising and successful farmers and business people, they brought some of their crops and agricultural techniques to the prairies. Coincidently two of the Canadian scholars taking part in CHESS 2018, Shelisa Klassen and David Neufeld, are from Mennonite backgrounds. A visible ethnic group in the Canadian prairies, including Saskatchewan, are Ukrainians whose forebears moved from the steppes of today’s Western Ukraine, then part of the Austro-Hungarian Empire, in the early twentieth century. Their cultural heritage and the history of their migration are commemorated in the Ukrainian Museum of Canada in Saskatoon. Because of the parallels between the environments of the North American and Eurasian grasslands, trees and shrubs that grew in the steppes were successfully introduced to North America prairies and plains from the late nineteenth century. During the CHESS field trip we saw several at the Saskatoon Forestry Farm (previously the Sutherland Forest Nursery Station), including Caragana or Siberian Pea Tree (Caragana arborescens), a native of southern Siberia and northern Kazakhstan; Siberian elm (UImus pumila); Siberian larch (Larix sibirica); and Tatarian maple (Acer tataricum). Cultivated crops, including wheat varieties, were also successfully transplanted from the steppes to the prairies and great plains. During our visit to the Canadian Gene Bank, curator Dr. Axel Diederichsen explained the history of the hybrid wheat Marquis. One of its parents was Red Fife wheat, which arrived in Canada, via Glasgow, Scotland, from the steppes of today’s Western Ukraine, where it was known as Halichanka. 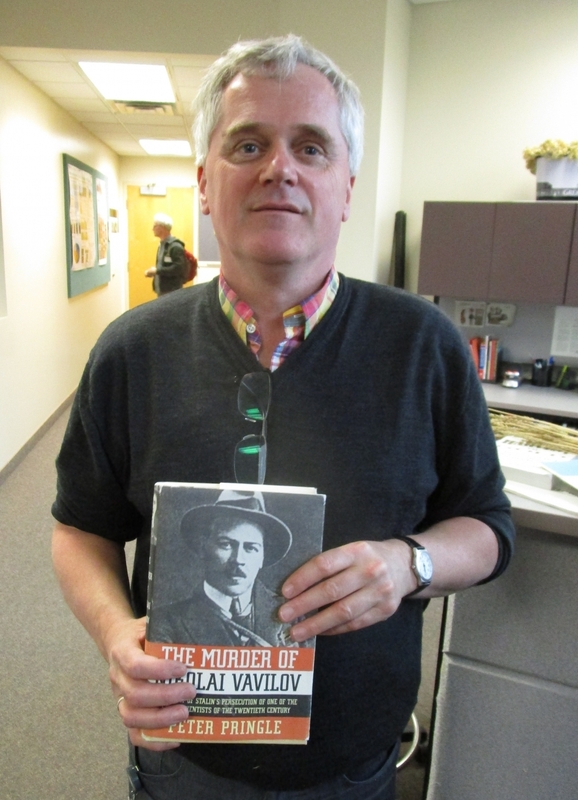 Dr. Diederichsen also explained the international importance of the scientific research into cultivated crops by the Russian geneticist Nikolai Vavilov, who tragically and wastefully died in prison in Saratov, in the steppe region, in the Soviet Union under Stalin in 1943.